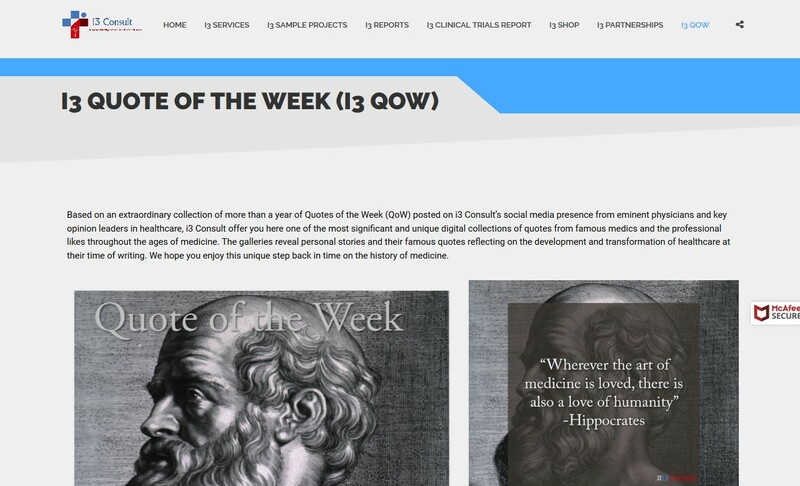 i3 Consult is proud to announce the launch of its i3 QoW Web page – https://www.i3consult.com/quote-of-the-week/. This Web content is based on an extraordinary collection of more than a year of Quotes of the Week (QoW) posted on i3 Consult’s social media presence from eminent physicians and key opinion leaders in healthcare. i3 Consult offers you here one of the most significant and unique digital collections of quotes from famous medics and the professional likes throughout the ages of medicine. The galleries reveal personal stories and their famous quotes reflecting on the development and transformation of healthcare at their time of writing. We hope you enjoy this unique step back in time on the history of medicine. We will continue to provide our quotes of the week with a focus on providing quotes from famous medics and allied key opinion leaders in healthcare which ultimately will reflect a timeline in the entire history of medicine. We hope you will like our collection of quotes, please follow us on Twitter, Google Plus and LinkedIn to get updated on our latest quotes of the week. As part of i3 Consult’s partnership with iClinical, we are pleased to announce the launch of iClinical’s Data Platform for Virtual Clinical Trials mobile app. This technology is destined to leverage clinical trial management and outcomes through data collection at the source of the trial app with secure FDA 21 CFR Part 11 compliance and real time analytics and trial automation. This application can reduce 20-30% clinical trial costs and accelerate the timeline to regulatory approval and market launch by 6 to 8 months. Therefore we look forward to introducing this smart and unique technology to our clinical trial business space. ➔ Data collection happens in front of the subject (eSource). Any patient reported outcomes, video, audio and medical devices data is collected at source. ➔ The AI based trial assistant (chatbot) enables real-time retrieval of protocol related information, it enables principal investigators to see more patients in lesser time. ➔ With reduced data cleaning and remote monitoring, we can drastically reduce study costs. ➔ Secure storage is in HIPAA compliant cloud servers. There is complete 21CFR Part 11 compliance, including audit trail of all the entered data, investigator signatures and secure access to the study tablets. ➔ Predictive analytics provides Pharma’s with the trajectory of the trial in real-time. This includes the endpoints, site status and study outcomes. 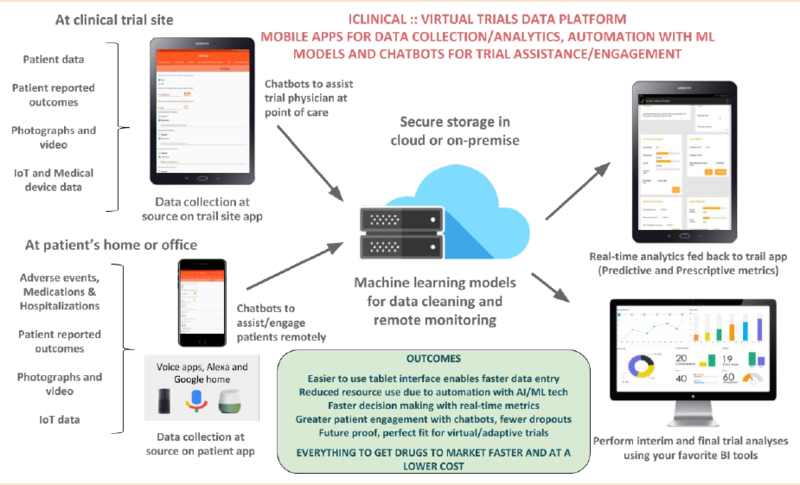 ➔ Machine learning models are used to clean the trial data at source, they are also used to generate holistic patient profiles and optimize remote risk based monitoring. ➔ With reduced data cleaning and remote monitoring, we can drastically reduce study costs. For a typical phase 3 clinical trial, we can save 20-30% of trial costs and get the drug to market sooner by 6-8 months. ➔ The platform is future proof and is perfectly suited for running remote and adaptive trials. i3 Consult is proud to announce the launch of new content for www.i3consult.com. As shown on our i3 Services page, this launch is to reflect our new service offer of greater niche consultancy solutions for “4Ps” sectors of the healthcare business space – Provider e.g. hospital, clinic or clinical trial site, Pharma e.g. pharmaceutical, biotechnology and life sciences entities who design and make new medicines, Payer e.g. insurance and government schemes which cover the costs of medicines and of course Patients, who have become the most important component in this patient centric market driven by healthcare outcomes. This new select range of capabilities has impacted positively on our core services. However we remain committed as ever before to our mantra of “i3” being our big three “i”s in our business model – Integrated Intelligence for the healthcare Industry and with this we continue to deliver great results for our healthcare, pharma and life science clients! . Building on this core service, we’ve added new ways to help clients access data, gain success critical insights, with the leverage of advanced analytics, design capabilities, and a range of game changing software solutions. Additionally as shown on the i3 Sample Projects page, it is revealed in detailed case study samples how i3 Consult is committed to delivering added value and accountable results to our clients. Visit www.i3consult.com today and discover how our core team of experts & our 200000+ network can empower your organisation to implement change, build capabilities and transform in this competitive healthcare business space! We hope you like the changes, if you have any questions or feedback, please let us know by e-mailing us. If you’d like to stay connected on social media, follow us on Twitter, Google Plus and LinkedIn.